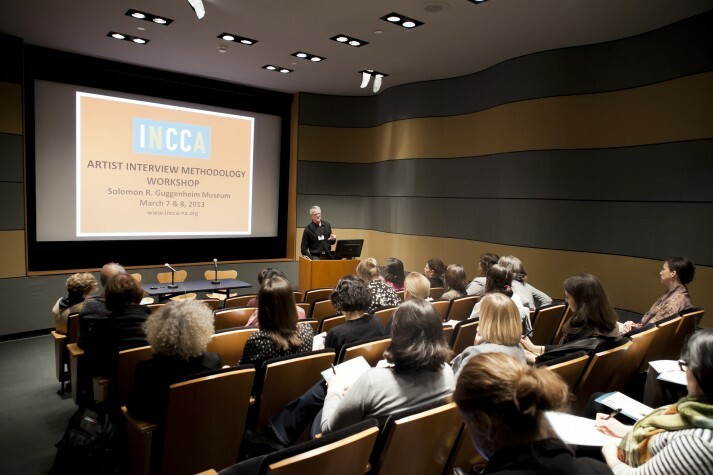 As conservators of contemporary art expand their practice to include artist interviews, they have a lot to learn from allied professions with years of experience in qualitative research. Oral historians, anthropologists, and sociologists know the advantages but also the risks involved with the use of interview research. In this brief essay, we formulate some lessons that may inform the relatively new interview practice in conservation. We present them to stimulate critical thinking about this valuable research tool. 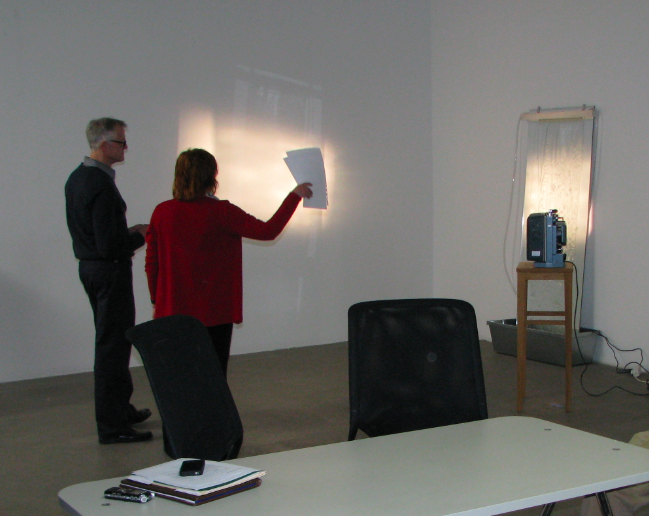 Glenn Wharton interviewing artist VALIE EXPORT about a work in MoMA’s collection. Photo Credit: Howard Deitch. Conservation interviews are unique in many ways. Unlike most scholarly disciplines, their aim is not simply to produce knowledge, but to produce practical knowledge, that is, knowledge that can be operationalized in practice. Conservators, therefore, are more concerned with life trajectories of artworks than life trajectories of the artists who produced them. They are less concerned with social circumstances of production and more concerned with materials and technologies of fabrication. Interviews can be very useful tools to produce this kind of practical knowledge. Through them, conservators can gain a more direct knowledge about the artist’s intentions and potentially establish clear parameters to decide how to clean and repair an object, how to design an exhibition, or how to display their work to enhance public experience. Yet, as sociologists, anthropologists and historians tell us, interviews are research tools with potentially problematic assumptions and unintended consequences. A fundamental recognition in humanities and social science textbooks is that interviewing is not a neutral method of information collection. It is a subjective process that is dependent on many variables. One variable is the questions themselves. The questions we ask, and the ones we don’t, as well as how we ask them, shapes the kind of responses and information we obtain. It is for this reason that interviews are better understood as guided conversations. The knowledge we obtain through the interview is always co-produced in the exchange between interviewer and interviewee. As social scientists and historians remind us, the knowledge produced through the interview process must be analyzed through a critical lens, always taking into account the dialogical nature of this process. Interviewees and interviewers have preset notions and personal agendas when they come to an interview. Conservators’ preset notions include knowledge gained during prior research and experience of the artist’s work. Artists’ preset notions include memories of producing the work and prior experience with conservators and museums. Interviewees are aware that interviews will be used to represent them, so they can deliberately shape their comments to conform to how they want to be perceived. Sociologists describe this as the staging of the self. Interviewers must establish trust in order to move beyond this staging to permit honest discussion about the artwork. Another important issue to bear in mind when assessing interviews is that when we ask artists about their intentions and their artistic practices we are never dealing with those intentions or practices themselves, but with accounts of those intentions and practices. And these accounts can be incomplete, distorted or simply wrong. Artists rely on memories that are necessarily selective, and at times incomplete or even mistaken. They may be aided by photographs or the presence of the artwork, but will inevitably be shaped by time and experience since its production. The production of these accounts is affected by different factors. For example, the presence of curators, studio assistants, and others has its own consequences. Artists can stage different selves in front of different audiences. They may be influenced by the potential for future acquisition and exhibition in the presence of a curator, while relationships with people they work with can influence what they remember and how they express their thoughts. Interview accounts can also be influenced by physical circumstances. An interview in the artist’s studio may be helpful in recovering memories or demonstrating the artist’s techniques and technologies. An interview in a gallery may facilitate discussion about exhibition, whereas conservation tools and materials may aid an interview in the conservator’s studio. In discussion about an upcoming interview with artist Anthony McCall, he asked to be interviewed three times in different settings. Informed by lessons from anthropology, he said that he would inevitably say different things in each interview, thus producing multiple and different accounts of his intentions and practices. It follows from all the above that the kind of practical knowledge we obtain from interviews is always mediated and dependent on a number of different variables. This, however, does not invalidate the use of the interview in conservation. On the contrary, knowledge of these variables is a necessary precondition to improve the use of interviews in conservation and to be aware of their limitations and unintended consequences. Let’s not work naively, but carry on in this collaborative enterprise. VoCA was established as a network of professionals that includes artists, curators, conservators and others engaged in the important work of preserving the legacy of today’s artists for the future. Assistant Professor, Department of Communication, University of California, San Diego. In conversation with Glenn Wharton, July 30, 2012.